Bald is Beautiful is a fundraiser for Cheshire Medical Center’s NCCC Kingsbury Pavilion, our local nonprofit cancer center in Keene, NH. Participants gather donations from their neighbors, co-workers, family and friends and, in turn for that support, have their head or beard shaved, or donate their hair, courtesy of MJD & Co. Hair Designs. All proceeds support the Patient Relief Fund* and Cancer Care Fund* and benefit local cancer patients. Do I need to shave my head? No! • New this year! Shave your Beard! • If a participant has 10 or more inches of hair, it can be donated to Pantene Great Lengths. This can be done instead of, or in addition to, shaving your head. • Join a team, only one team member has to shave their head. • Instead of shaving, share why you are passionate about this cause. Creating your page to share how cancer has touched you or a loved one is a powerful way to raise awareness and support for patients in treatment. Let people know why you are participating. Use all kinds of media – Facebook, Twitter, email, phone calls, etc. to ask for donations. Ask local businesses to donate to you and/or your team. Share stories (with permission if needed) of people you know who have been impacted by cancer. 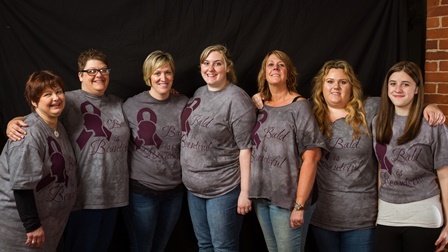 Thank you to Scott Hussey Photography for being the photo sponsor for Bald is Beautiful! Scott will be back again this year to photograph Before & After shots of participants. To view the 2018 photo gallery, please visit Scott’s website. Thank you! 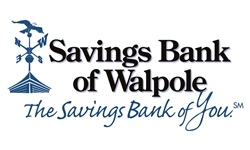 Thank you for supporting our local cancer patients! *The Patient Relief Fund provides financial assistance to local patients receiving care at the Kingsbury Pavilion who have difficulty covering daily living costs like gas, heating fuel, and groceries. The Cancer Care Fund allows the purchase of equipment and items for patient care and comfort at the Kingsbury Pavilion, such as television monitors for chemotherapy infusion chairs and blanket warmers. To learn more about becoming a sponsor of Bald is Beautiful, please contact Jim Boden, Director of Annual Giving, at 603-354-6810. 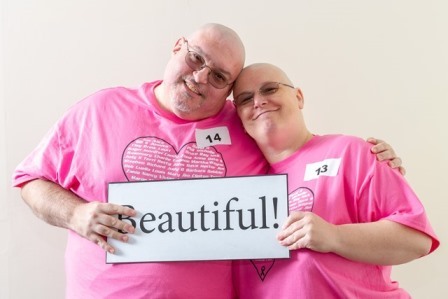 For 11 years, MaryJane and her staff have helped make Bald is Beautiful a success. Thank you sharing your time and talent to support local cancer patients!